The Middensluiseiland island will be significantly expanded over the next month, and the area between the lock heads will soon again comprise fully recovered land. The contractor will be using this land for the cement production facility, which will manufacture all the cement required for construction work. A Ro-Ro facility in this section of the Middensluiseiland island is used to unload equipment and materials onto the shore. The cofferdams for the lock heads are also slated for construction on both sides of the new lock. 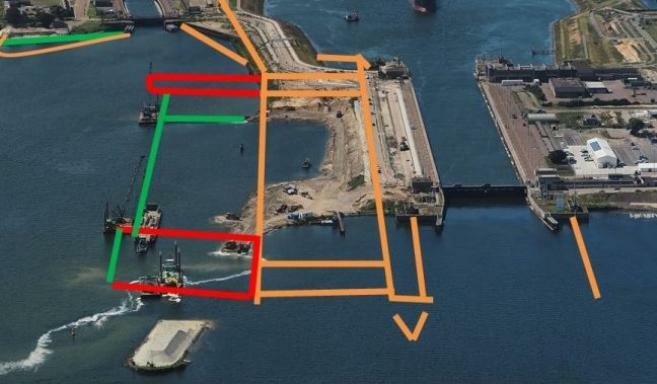 Around the east side of the island, preparations are currently underway to create the connection for the new lock to the Noordersluis lock. Due to work performed on the new sea lock and for regular maintenance, the current locks will be inaccessible on several occasions on October. Any obstructions will always be communicated in advance, by announcements to vessels and through other channels. According to the Port of Amsterdam, the Zuidersluis IJmuiden lock will be inaccessible from 9:00 a.m. to 8:00 p.m. on 18 October 2016, due to a door change in the exterior lock head.